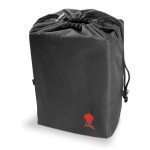 There is a Weber grill cover 7107 that comes with a handy storage bag. 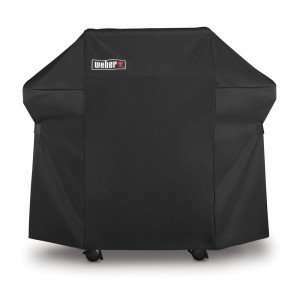 This Weber grill cover is made for the Genesis gas grill and made of a polyester fabric and this makes it a light weight cover. Some people think that light weight also means a lesser quality but this does not have to be the case. We found a lot of reviews of this grill cover and this has to do with the fact that it is made for the Weber Genesis grill and this is a very popular grill. The used polyester makes the cover easy to put on the grill because the nature of polyester is that its more pliable the PVC. The light weight seem to confuse some people who bought this grill cover a little and at first the thought was that it was a lesser quality, but this is not the case. Many people compare them to the older materials used for grill covers and tarps. These newer materials are more lightweight but have the same quality as the older ones. The storage bag that comes with the Weber 7107 grill cover will probably come in handy for longer cooking session, but I always fold mine up and put it to the side. Storing a grill cover for a few hours in a bag does not make sense to me, but that is just my opinion. Read that a buyer had no problems with this grill cover this last winter in the northern part of the country and that is stayed easy to put on and take of the grill. Some one else mentioned that after a very hot summer that was followed by an extreme cold winter the cover did shrink and he had a hard time getting it over the grill. Overall this grill cover gets some good reviews and to be honest we did not expect anything else from the Weber company. Like any other grill cover it is impossible to make one that will fit all weather conditions. It will not last for ever and will have to be replaced after a certain time. How long it will last depends in my opinion on the circumstances you use it under. In extreme climates it will not last as long as in milder climates. In a covered porch or patio it will last longer than when placed out in the open. Overall this Weber 7107 grill cover is a pretty good grill cover that with its measurements will not only fit the Weber genesis but a large range of grills that come in about the same size. Read all the grill covers we reviewedhere.